The main features of AC3200 is it works with AiProtection network security , armed with Trend Micro like TP-Link , have Adaptive QoS and we can setup Parental Control. Supports 802.11ac tri-band Wi-Fi standard ranges up to 3200Mbps for low-latency online gaming, smooth 4K UHD video playback and extremely fast file-sharing. 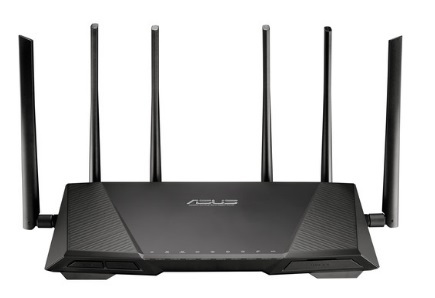 ASUS equipped with high performance antennas to work on beamforming technology for first class Wi-Fi range. ASUS Router App allow us to control our network from anywhere. It supports USB 3.0 port for 10X-faster data transfers than USB 2.0. Go to the port forwarding section. First Download the openVPN configuration files from the link https://www.privateinternetaccess.com/openvpn/openvpn.zip . Unzip a .Opvn file from the download. Each one is for a different location ie US, Aus, UK , india etc. Go to VPN in AC3200 settings. Click the VPN Client tab. Put in your user name and password. When it asks import opvn file select the upload file and select the opvn file (unzipped IN 2ND STEP ). Hit upload. Tick import the ca option and upload the CA. Select the .crt file and upload. Open the .Pem file in notebook or esfile Explorer on a phone and copy all the text. When it asks manual setting, hit edit. It will bring up a menu with 5 cert boxes. The top one will be pre filled from the crt file. paste the pem file text into the bottom box (cert revocation list) and save. Ok the settings then activate the VPN. There must be a blue tick to confirm it’s active. Test on the PIA website, it confirms about protection.